Tottenham's Jermain Defoe missed an injury-time penalty against his old club in an exciting draw at West Ham. 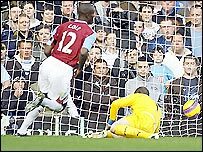 The Hammers seized on a Younes Kaboul mistake to take the lead as Luis Boa Morte stole in to find Nolberto Solano, who crossed for Carlton Cole to tap in. Spurs were furious at being denied a penalty when keeper Robert Green seemed to have fouled Robbie Keane but Michael Dawson's header hauled them level. Defoe won a penalty after a Lucas Neill foul but saw his effort saved by Green. The match had started at a frenetic pace and Spurs made the early running as they penned the Hammers back. Jermaine Jenas had a strike parried by Green and Aaron Lennon thought he had slotted the visitors ahead from the rebound only to be flagged offside. 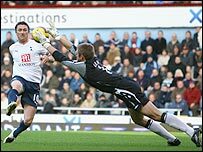 At the other end, the theme of England players being booed after their Euro 2008 qualifying failure continued with Spurs keeper Paul Robinson being barracked with his first touch. Robinson spilled the ball as he went up with Matthew Upson as the pair challenged for a corner and was fortunate the referee blew for a free-kick against the Hammers defender. Spurs had dominated the early stages but found themselves behind after a mistake from centre-back Kaboul, whose poor clearance was charged down by Boa Morte. He charged towards the Spurs goal and slipped a clever pass to Solano and, after he drew Robinson and Dawson towards him, intelligently crossed for Cole to slot into an empty net. The home side grew in authority after the goal, while Spurs struggled to recover from the blow as their play lacked punch. Boa Morte was worked into a promising position only to power an angled shot straight at Robinson before the visitors were denied a penalty on the stroke of half time. Keane, who appeared offside, chipped the ball over Green and was caught by the keeper as he tried to round him to slot in. The ball went wide and Spurs were left in disbelief as referee Mike Riley failed to award the spot-kick. Spurs boss Juande Ramos took Kaboul off shortly after the break and brought on striker Darren Bent in an attempt to salvage something from the game. And they equalised after West Ham repaid the favour of gifting them a goal. Dawson met a free-kick and nodded into an empty net after Green failed to punch away a free-kick. In an action-packed finish, Scott Parker and Dean Ashton each had shots well-saved by Robinson as both sides chased the win. West Ham had the better chances and George McCartney had a header cleared off the line by Jenas. But it seemed Spurs were going to steal a win when substitute Defoe was brought down by Neill and was awarded a dubious spot-kick. Defoe picked himself up to take the penalty only to see Green palm his effort against the post before the joyful Hammers cleared to earn a point. "I'm knackered. The game went up and down. "You have a penalty awarded so late and think that's it but it was a great save by Robert Green. It was a deserved point and I think it was a fair result. "I thought we were going to nick it. We've had big problems injury-wise but the boys that have come in have done a tremendous job." "I'm not happy but we are not going to talk about the ref. "I think it was a penalty (when Robbie Keane was fouled) and a red card (for Robert Green). That would have been a big change for the rest of the game." He added: "I think we did enough to win it. We are a little bit disappointed but that is football. We are still unbeaten and we have to keep going." West Ham: Green, Neill, Gabbidon, Upson, McCartney, Solano (Spector 82), Mullins, Noble (Parker 63), Etherington, Cole, Boa Morte (Ashton 72). Tottenham: Robinson, Chimbonda, Dawson, Kaboul (Bent 54), Bale, Lennon, Jenas, Zokora, Malbranque, Berbatov, Keane (Defoe 78).